Following is part two of the talk given by writer and activist Ann Pancake in May 2016 at the University of Hawai‘i. I’ve now been involved in the fight against mountaintop removal for 16 years. What I’ve witnessed in sixteen years is extraordinary success in the Appalachian environmental movement’s educating people not only all over the country about mountaintop removal, but people all over the world. That education has fueled enormous outcry against the destruction, including myriad efforts through lawsuits and legislation to halt the mining or at least slow it down. Scientific study after scientific study have been published proving the deleterious effects of mountaintop removal on all forms of life, including human, along with economic studies that point out this type of mining’s lack of viability in the long-term. Yet mountaintop removal has juggernauted on. I remember something a man named Willard said to me fourteen years ago when I was interviewing him. Willard’s property was surrounded on three sides by mines when I met him. His house had cracks all over the interior walls from the blasting, and he was enduring crippling health problems which he suspected came from his well being poisoned. What Willard said summed up perfectly what I would come to feel after a few more years as an activist: “We just keep fightin and fightin and fightin, and it seems we can’t get nothing done.” Mountaintop removal mining has slowed only recently not because those in power have decided to listen to the majority of Americans and Appalachians who want their environment protected, but because coal is being challenged by natural gas as America’s fossil fuel of choice. So in Appalachia we are trading one devastating environmental practice—stripmining—for a different one—hydrofracking. Periods of disintegration most often contain within them profound possibilities for creation. Things generally have to break down before something new is born. Following that logic, an era like this one, precisely because of the scale and scope of its dissolution, offers tremendous opportunities for sweeping systemic change. I’ve come to believe that the only solution to our current global mess is a radical transformation of how people think and perceive and value. And I MEAN radical transformation of how people think and perceive and value. I mean we have to look beyond current dominant Western epistemologies, which, I would argue, are restricted by Cartesian logic, by mechanistic understandings of science, by anthropocentrism, and by a blind devotion to technology. I’m not advocating throwing these out entirely; but I don’t think these ways of knowing, by themselves, are viable any longer. And by “viable,” I mean we can’t physically survive as a species if we hang onto them to the exclusion of other ways of knowing and seeing. I believe we must revolutionize our interiors. And now I come back to that question that Frank asked me to address for this talk: what is the responsibility of the artist to her place and community, given current global crises, in particular, environmental crises? And I think of something I heard Barry Lopez say in a talk he gave in Homer, Alaska, four years ago: What we need now, Barry said, is not more science—but more art. I believe the revolutionizing of interiors is exactly what art can do better than anything else at our disposal, aside from spirituality and certain kinds of direct experience which are not as easily available as art. One way to start revolutionizing interiors is by educating people, and art that does documentary work, does that truth-telling, can contribute to that kind of education. But given our dire circumstances, I believe we artists must open ourselves wider to how art serves society beyond the ways art bears witness. Take, for instance, art’s power to exercise, develop, and revitalize the imagination, the imaginations of both readers and writers. In our culture imagination is impoverished and misdirected at a time when we desperately need new vision and ideas. The literary arts, especially fiction, make more extensive and sustained demands on a reader’s imagination than perhaps any other form of media. Admittedly, the imaginative effort a person must make to read literature means some won’t bother to engage with it at all. However, those who are willing to participate can come through the interaction deeply imprinted precisely because they had to engage their imaginations so energetically. And that exercising of the imagination can help readers and writers imagine better in other parts of their lives. Following is the last part of Ann Pancake’s talk. I want to point out, too, the way literature and art in general all art can reunite an individual’s conscious and unconscious. This re-uniting happens in both the artist and in the artist’s audience. I can’t emphasize how imperative I think this reunion is. I would argue that many of our contemporary ills are caused or made worse by our culture’s rending the conscious from the unconscious, then elevating the conscious—the intellect, rationality—to the complete neglect, if not outright derision, of the unconscious. This is disastrous not only because such psychic amputation cripples people, contributing to feelings of emptiness, insatiability, depression, and anxiety. It’s also disastrous because within that castoff unconscious—in intuition, in dreams—dwell ideas, solutions, and utterly fresh ways of perceiving and understanding that we need urgently in this era of transition. I, like all artists, know the power of the unconscious because it’s where I’ve gone for decades for my fiction writing. I know how boundless that realm is, and I know my unconscious is eons ahead of my intellect, worlds larger in vision than my rational mind. This is exactly where we’ll find the materials and the fuel for that transformation of psyche I’m talking about. And our very business as artists is trafficking between the conscious and the unconscious. We’re actually one of the very last groups in this culture who have a sanctioned day-to-day relationship with our unconscious, with our dreams and intuition. Now I’ll go a little further with this notion of artists’ reintegration of the conscious and the unconscious, by proposing, too, that artists are translators between the visible and invisible worlds. Intermediaries between the profane and the sacred. How is this pertinent to the case I’m making for art’s ability to create change in the world? Only by de-sacralizing the world, over centuries, have we given ourselves permission to destroy it. In order to protect and preserve life we must re-recognize its sacredness, and art helps us do that. 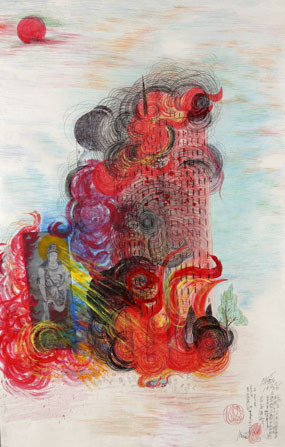 Art re-sacralizes by illuminating the profound within the apparently mundane. Art can restore reverence and wonder for the everyday. Art heightens our attentiveness and enlarges our compassion. And for most of human history, storytellers, along with shamans, were the community members who moved between worlds and found ways to translate into language concepts and emotions and energies that transcend ordinary human language because they originate in worlds that are not human. I want to say here a few words about the contributions of Hawaii and its culture and its ethics to the revolutionizing of interiors, to the revising of conventional Western epistemologies, that I’m talking about. I hesitate to say much about this, because I know so little about Hawaii. And I hope that during our discussion following this talk you can tell me more of your perspective. But from what I can discern from the times I’ve visited Hawaii and from what I’ve read about it, many Hawaiians, of all ethnicities, still carry a living sense of this land being sacred. That sense is not nonexistent on the Mainland, but, as you know, is largely absent there, except as rhetoric. However, I think even many Mainland tourists leave Hawaii with at least a slight insight into how you perceive the land as sacred. And, again, I don’t want to presume too much because of how limited my knowledge is, but I can see Hawaii and its particular belief systems as extremely important to this revolution in thinking and feeling I believe dominant Western culture must undergo. Both Barry and I have arrived, separately, at the conviction that Western industrialized people, if we are to survive, need to take very seriously certain values and certain kinds of knowledge that pre-industrial indigenous peoples had and still carry now for us now. As you do here in Hawaii. This is not some naïve romanticized belief that we can and should return to pre-industrial culture, but the understanding that we must essentially re-learn from those cultures how to have sane and healthy relationships with the natural world. I had the wonderful opportunity on Saturday to go to the East Maui Taro Festival in Hana. I can’t tell you how moved and inspired I was by the passion of the people there for reviving traditional fruits and vegetables and sustainable ways of farming, along with the dedication to protecting the land on Eas Maui. The whole festival was infused with this love and enthusiasm for the land and the ocean. I’ve seen nothing like that on the Mainland, not at a festival where people from all walks of life were just there, celebrating taro and having a good time. On the Mainland, I’ve only seen this kind of thing at events put on and attended by people who identify as environmentalists of some sort. Art holds other powers for rattling stagnant paradigms, but I’ll just address one more, one that at its best would pull together much of what I’ve already said: the power to envision alternative future realities. My biggest disappointment in my own novel is that it does not provide much concrete vision beyond the contemporary situation in central Appalachia. I have learned that it’s much easier to document a political situation in literature than it is to propose alternatives, to dream forward, without falling into pollyanna-ism or dystopia. But I’ve come to believe that my greatest challenge now—and a challenge for many twenty-first century artists—is to create art that imagines a way forward that is not idealism or fantasy, not dystopia or utopia, but still turns current paradigms on their heads. I’m going to close this evening by reading for a while from a chapter in my novel that features a character who is struggling with what he knows intuitively about the sacredness of the land he lives on and what he’s been taught about the land his whole life through his culture, primarily his church and the economic system. One of the many complex tragedies of the decimation of the land in Appalachia is that Appalachian people are actually deeply attached to that land and to their place, much more so than many non-indigenous people in the United States. I say this attachment is complex because Appalachians are also deeply complicit in destroying their own land, a paradoxical complicity I won’t have time to talk about tonight. This is from a chapter narrated by a character named Mogey, who is a disabled miner in his fifties. He was an underground miner, not a strip miner, and a part of the mine roof fell on his head and he still suffers from that injury. He and his wife live in a small house that has mountaintop removal mining all around it. Mogey as a character is a composite of several people I met in southern West Virginia while doing research for my sister’s documentary and my novel. 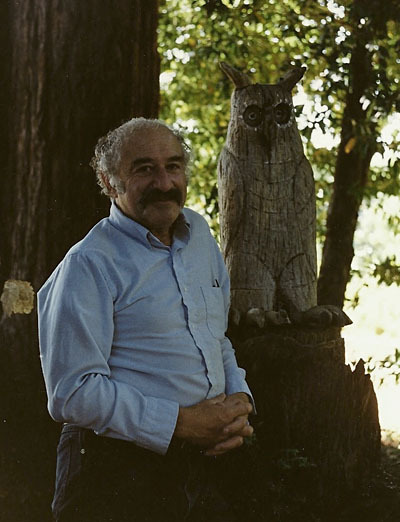 Photo by Dyanna Taylor, circa 1990. Chester Aaron’s stories have appeared in two issues of MANOA: Enduring War: Stories of What We’ve Learned and Almost Heaven: On the Human and Divine. The following is his first published writing. He served in the U.S. Army’s Armored Infantry Division in Europe from 1943 to 1946 and participated in the liberation of the Dachau concentration camp. Later in 1946, he enrolled at UCLA. “In the Palm of my Hand” draws on his war experience and was published in The Daily Bruin, UCLA’s newspaper, on page 4 of the Sept. 26, 1946, edition. Serena Enger, a friend of Aaron’s who is a librarian, asked him for a copy of his first published writing, but he had forgotten this piece and was unable to help her. Undaunted, she used her skills and tools as a librarian and found the article on microfilm. She retyped it and emailed it to Aaron on Sept. 26, 2012, sixty-six years to the day of its publication. It does not express or represent a reconciliation but reminds us of the constant need for personal reckonings with history. I held within my hand yesterday, all the agonies and pleasures, all the heartaches and joys, all the miseries and contentments, as is possible for one being to possess. All of the emotions ever felt, ever attained by man were here – here in the palm of my hand. For today I held in this hand a small bar of soap made of the bones and flesh of men, women and children – victims of the Nazi concentration camp of Mauthausen. Forever, I believe, I shall remember the greasy sensation as my hand clutched that bar, and as I smelled it the bitter and pungent aroma increased tenfold when I realized that I was breathing into my nostrils the marrow of our civilization. A civilization just as surely dead and just as surely vanished as are the bodies of these peoples. What man, what woman, what child, gave of their life so that this small bar of taunting shame might be flaunted before our eyes? This gray by-product of a civilized era. An era in which man advanced so rapidly in all fields, excepting the field of human relations. As that bar rested in my palm I noticed a dark gray splotch in the middle of the top, darker gray than the bar itself. That, perhaps, is the face of Hans Friedlow who whistled as he climbed the mountain trails in the cold mornings and who used to wonder at the edelweiss blooming on the slopes of his beautiful Bavarian Alps. Or perhaps it is the sun-darkened back of David Meyerberg, skilled surgeon, who used to lie on the beaches of the Chiemsee on warm August Sundays, watching his curly haired children frolic in the sands. Or perhaps it is the children themselves. A child would not make too large an impression in all the agonies laid here to view. There was a piece chipped from the upper corner. Perhaps that is the throat and chest of Hildegarde Brenner who enthralled audiences throughout Europe with her ringing soprano voice, who was happiest when singing or strolling beneath the swaying trees on the Unter Den Linden. And if it is her throat and chest or if it is any part of her, then she must be content, because she is as she was in life, withdrawn from the rest of the flock. That choking odor – it could not be the scent of the gorgeous Martina who held breathless the audiences of Berlin and of Vienna and of Paris as she acted in the plays of the continent. Could it be lovely Martina who now emits this odor? She who possessed the most varied collection of perfumes in Europe? Could it be she who lies there within that gray block and reeks late our throat? Here within this block lies the hopes and fears of a multitude of beings. They who died because they wished to live. Within this block rests that farce, named humanity, called decency, called love. Behold within my hand the utter fantasies of war. The whippings, the starvations, the freezings, the smotherings, the miseries of separations and the screaming of farewells, the fearful knowledge of coming crematories. The extreme end to which a body can go and then go no further. You who scream hate, and discrimination, feel this block, press this bar into your palm and attempt to forget the pangs of hunger and thirst and cold and torture. Close your eyes and close your nostrils. But the Lord will not permit the closing of your conscience. The potency of this bar of soap, the thoughts within, careen from one wall of thought to the other. It hammers at your soul, beats at your senses, throbs with the race of blood in your temple. “Remember me!” it screams. And remember, I shall. Long after that soap dwindles to invisibility, I shall remember the feeling as it lay in the palm of my hand and as I gazed at it. I did not see the soap. I saw in its stead, dangling arms and legs and heads of those who gave. I held the blood and the flesh of countless numbers. What feelings, what emotions, what memories laid there within my grasp? The eleventh anniversary of 9/11 will be marked in myriad ways. We are choosing to do so by bringing readers’ attention to an exceptional example of using the imagination to produce a significant and lasting reconciliation. 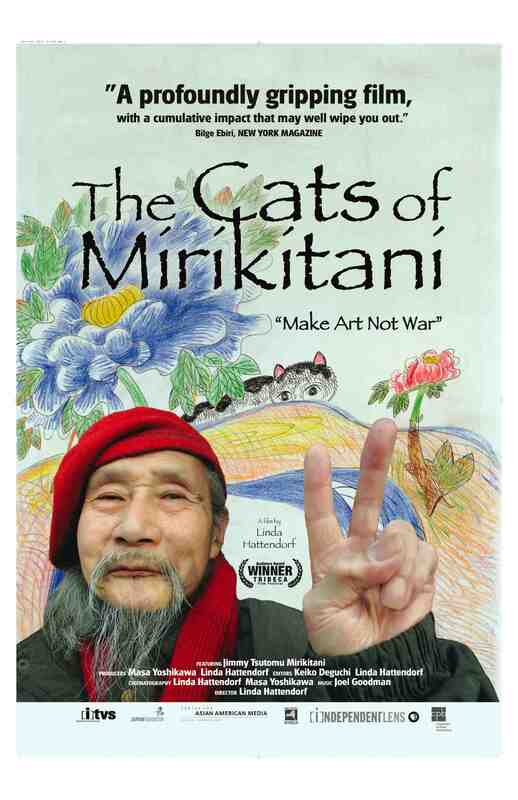 The Cats of Mirikitani, a 2006 documentary by filmmaker Linda Hattendorf, tells the powerful story of artist Jimmy Mirikitani: his internment and loss of American citizenship during World War II, his life of homelessness on the streets of New York City, and his eventual reclamation of family and country. The following interview with Hattendorf was conducted by Pat Matsueda and Nelson Rivera one day before 9/11’s eleventh anniversary. The Cats of Mirikitani begins with shots of Jimmy on the streets. We assume that you were filming many things—Jimmy being just one—and that you were drawn to him because of how his life had been shaped by art and by loss. Then, during the filming process, the 9/11 attacks on the World Trade Center happen. The film begins to explore the parallels between the anti-Japanese sentiment during WWII and the paranoia surrounding Middle Eastern populations in the United States after 9/11. Did you have another direction for the film before the attacks? If so, what was it? People often ask me when I knew I was making a movie. The film started almost accidentally, and evolved organically over time. I first met Jimmy in January of 2001. He was clearly homeless, and seemingly quite old. It was a particularly harsh winter in New York, and he was taking shelter under the awning of a deli not far from my apartment. Despite the cold temperatures, he was energetically drawing pictures of cats late into the night. I was curious and concerned—and I like cats—so I struck up a conversation. He gave me a drawing and asked me to take a picture of it for him. I was working as an editor of documentary film at the time, and had a small video camera. So I returned with the camera and asked him to tell me about the pictures he was drawing. It turned out he had lots of stories to tell. All kinds of tales spilled out in a jumble and it took me a while to begin to piece together what had happened to him. So I kept visiting. And I found that if I brought the camera, he would talk to me. So at first the camera was just a tool to get him to talk, to find out why he was there, what had happened in his life. I initially thought I would just make a short video portrait of the life of this homeless artist, and hope that someone would see it and help him. But as I began to understand what had happened to Jimmy in the past, I realized how significant his story was historically. During WWII, not only was he forcibly removed from his sister’s home in Seattle and sent to a Japanese American internment camp, but he lost countless family members and friends in the bombing of his ancestral city of Hiroshima. I began to explore the link between losing home in such a profound way in the past and his state of homelessness sixty years later. I thought this tale of trauma, loss, and discrimination was the story I was telling. By 9/11, I had been documenting his life on the streets for nine months and we knew each other well. After the fall of the World Trade Center, I couldn’t bring myself to just watch him coughing in the smoke through the lens of the camera, and I impulsively invited him home. We were suddenly surrounded by eerie parallels to the climate of the country after Pearl Harbor—only this time a different group looked like the enemy. At that point it became clear that there was an even bigger story here, and that it urgently needed to be told. Some people would say that your act of empathy is a gift from one artist to another. It set in motion a series of events that enabled Jimmy the individual to reconcile with America the country, to help him regain his country, his family, and so on. That act of empathy is as remarkable as Jimmy’s story. Have audiences responded to or remarked on this aspect of the film? Documentary filmmaking for me is a way all of us can witness the lives of others, see the world from inside the point-of-view of someone we might not otherwise understand. I enjoy making these stories visible, giving a voice to those who don’t always have the means to tell their tales. The history of those like Jimmy is not often depicted in mainstream media. As an artist, he was drawing pictures of these events because he was determined that this Japanese American history not be ignored or forgotten. I hope my film is an extension of his own desire to be visible. What has been so rewarding is seeing so many audiences around the world embrace the film; people from so many different backgrounds all seem to laugh and cry in the same places in the screenings—proving to me that in the end, we are all one big family, made of the same stuff. Putting to rest the ghost people, as Jimmy calls them, helped him to (a) bring certain life-shaping memories to a close and (b) move forward in the present. At the beginning, he has no home and is completely alone. At the end of the film, he has his own apartment, and friends are joining him for a celebratory dinner. As a result of Cats, Jimmy’s story and art have reached many people. Does he still draw cats and scenes of the internment camp? Have his drawings changed in subject matter, mood, style? What is the present like for him? Jimmy’s art changed after we attended the pilgrimage to the Tule Lake camp. When I met him on the street, he was drawing images of the camp over and over again, obsessively sketching the barracks, the mountain, and himself trapped behind a huge fence and gate. When we went back to that same site so many years later, the bus turned a corner and suddenly there was Castle Rock Mountain, exactly as he had been drawing it from memory all these years. As soon as we got off the bus, Jimmy pulled out his sketchpad and started drawing. From that day on, he continued to draw the mountain, but soon the barracks were replaced by tombstones for those who died in camp, and then by cheerful little houses and traffic along the formerly empty road. He drew an open gate, and then the fence disappeared altogether. And he never put himself in the picture again. I believe he literally got out of that landscape by returning there and confronting the past. Being reunited with a community of people who had experienced what he went through, and wanted to hear about it, was incredibly healing for him. The Tule Lake Committee organizers do an amazing job of creating a safe environment where former internees and their families can talk about that trauma, often for the first time. At ninety-two, Jimmy shows no sign of slowing down. He recently had a one-man show in Santa Fe, New Mexico, and wanted to travel the west coast beforehand. So Masa Yoshikawa [her co-producer] and I took him to another Tule Lake pilgrimage, then to a screening and exhibit in Denver, then to the show in Santa Fe. Jimmy is like a rock star, surrounded by fans wherever he goes. He loves the attention. Roger Shimomura, the Japanese American artist who is shown in Cats visiting Jimmy on the streets, curated an exhibit of Jimmy’s work which originated at the Wing Luke Museum and now continues to travel around the country. 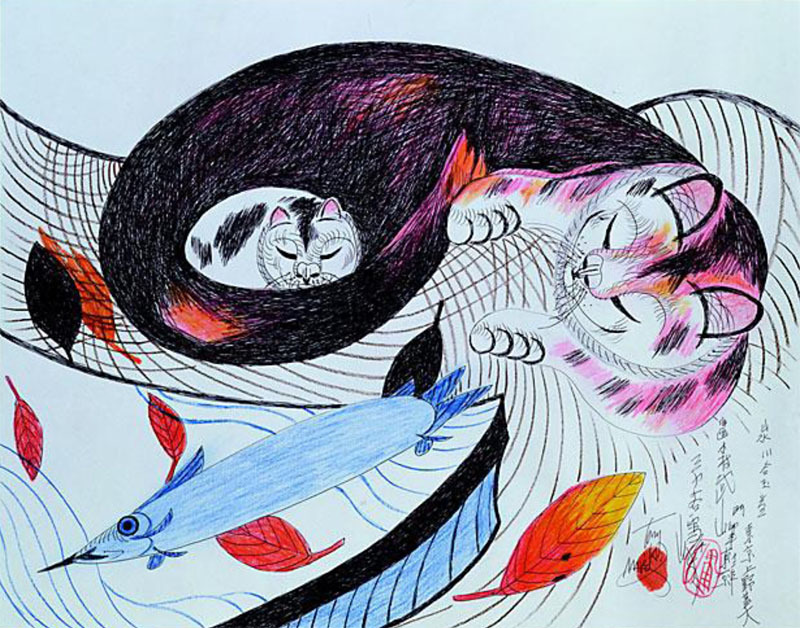 Masa had a book published in Japan depicting Jimmy’s life and art (Peacecats). 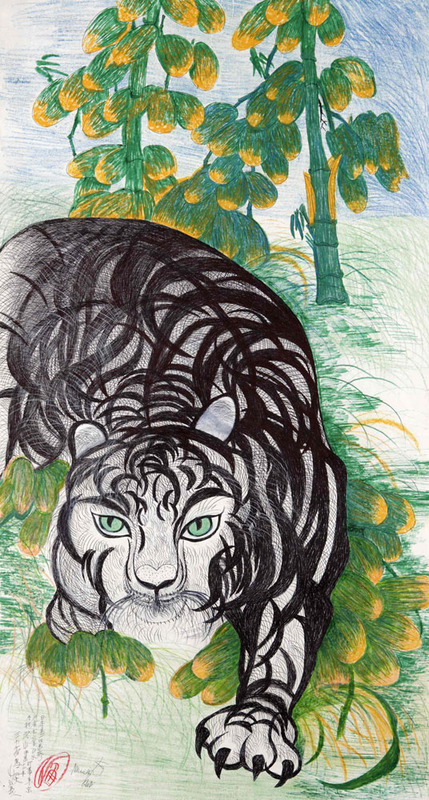 Several museums carry reproductions of Jimmy’s artwork as well as the Cats DVD, and there is now a children’s book in development using his art as illustrations. And yes, Jimmy still draws cats. I don’t think that will change. The cats are always popular. I had no idea how many cat lovers there are out there. People from all over the world send us pictures of their cats! Have there been attempts to connect with Jimmy’s family in Japan? What is his relationship with his American family like now? Ruth Addeo née Mirikitani is a cousin who discovered Jimmy when she saw the film playing in a cinema. A music teacher living on Long Island, she baked this cake for him. Jimmy and I have now met many Mirikitanis, both in the U.S. and Japan. 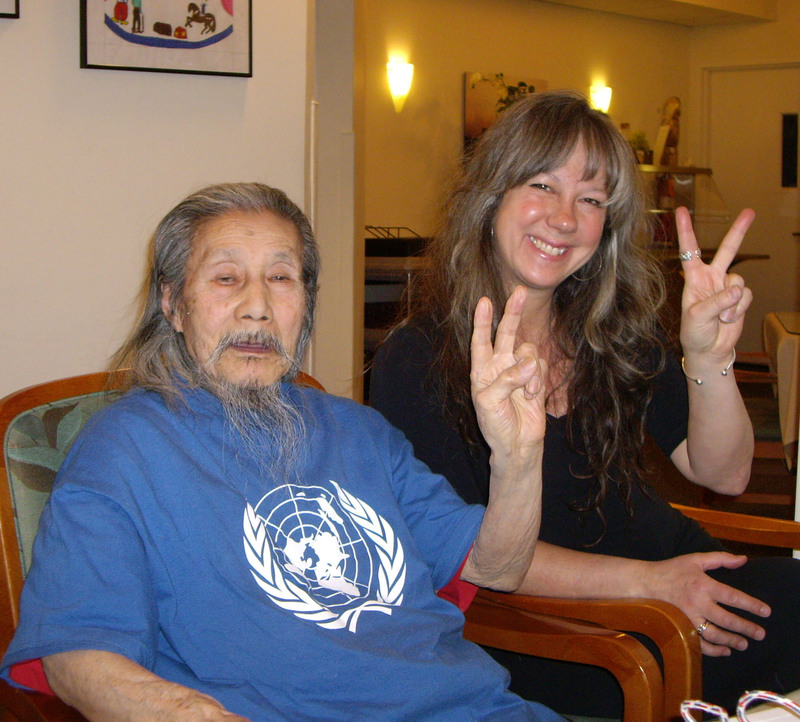 Masa helped me to take Jimmy back to Hiroshima for the August 6 Peace Ceremony in 2007. That was a powerful trip for all of us. The family there unfurled a scroll with the family history that does indeed go back to Samurai times. 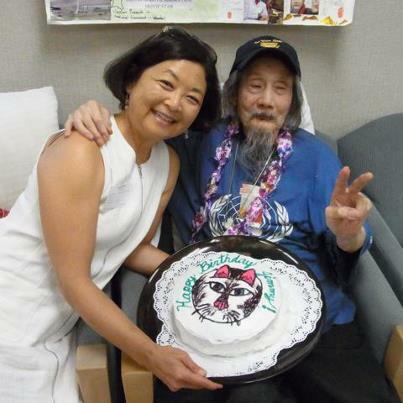 And we are so glad Jimmy was able to reconnect with his sister Kazuko in Seattle before she passed away this year. We have met Mirikitanis from Hawaii, California, and a cousin right here on Long Island who discovered Jimmy through the film! She visits regularly and baked him a special cake for his birthday last year! You and Jimmy developed a powerful bond. The scene in which he expresses his worry about your returning late is very touching. Did you ever discuss working on film or art projects together? Well, yes, sharing a one-room apartment with an eighty-year-old stranger for almost six months was certainly a bonding experience. We had our ups and downs, but in the end, we became like family. It’s been more than ten years since we met, and to this day I still visit Jimmy weekly. He introduces me to people as his granddaughter. We understand each other as artists, and as human beings. I credit him with the idea of making the film, since it was his initial request of “take a picture” that got me started on this adventure! He taught me a lot about the daily process of making art. After 9/11, it was such a scary time, especially here in New York, and I wasn’t sure what to do next. But no matter what was happening, Jimmy just kept drawing. And so I just kept shooting video. I believe making art is how Jimmy processed the many traumas in his life. That has been a good lesson for me. What films are you working on? How did The Cats of Mirikitani change your life, your ideas about filmmaking? What did it reaffirm about the way you understand and treat people? Screening Cats around the world has really reaffirmed my deep belief in our common humanity. As a result, I’m currently developing a film called Picturing Peace. It’s a look at cultures of peace around the world, past and present. We know plenty about the history of war. I think it’s time we started seeing what peace looks like, and learning how to speak that language as well. I visited the University of Peace in Costa Rica earlier this year—a country that abolished its army in 1948 and put those funds into education instead! Imagine that! I hope to raise funding for more travel and interviews in the coming year. Meanwhile, I continue to edit and consult on documentary films for others, teach at the New York Film Academy, and occasionally appear at screenings of The Cats of Mirikitani. The Manoa Readers/Theatre Ensemble production of Aldyth Morris’s play was presented this past weekend at Kennedy Theatre, on the UH-Manoa campus. 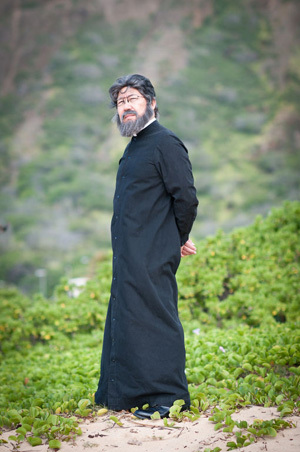 The play was directed by Tim Slaughter, of Outreach College, and starred veteran actor Dann Seki as Damien. John Keawe sang and provided background music, and Nyla Fujii-Babb performed the opening chant in both Hawaiian and English. A saner world would be a version of heaven. If we didn’t feel ourselves capable of being almost there, through words and action, the world’s heart would always be breaking. In Almost Heaven we’ve brought together writers from past volumes—along with some new to our pages—who believe that the function of art, individuals, and communities is to create Merton’s saner climate of thought. Among these writers, we’re proud to include Aldyth Morris, whose play Damien is the centerpiece. Various ethical conflicts shape Damien, the most significant being Damien’s struggle with his notion of what is right and good in the eyes of God. The play ends with him addressing God and asking for a divine sign of acceptance of his faith and actions. The kind of reconciliation we are accustomed to—in which forgiveness is awarded or acceptance clearly voiced—is not found in Damien. However, the play poses a series of questions and shows us, powerfully and memorably, how essential they are to people of conscience. Only at the end of life, the play seems to suggest, are the questions resolved. 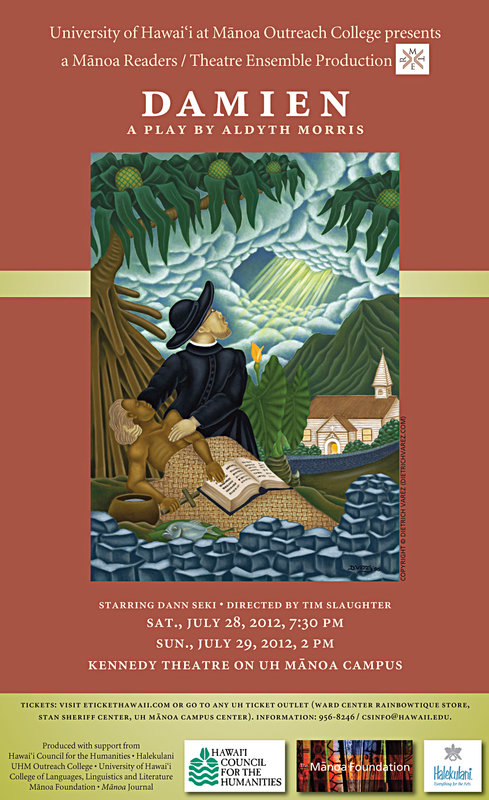 The eight-page program guide developed for the play contains information on the production, Father Damien, and playwright Morris, as well as a timeline and a list of selected readings. A medium-resolution PDF version of it is available. Manoa Readers / Theatre Ensemble presents performances of literature and drama for university, community, and statewide audiences. 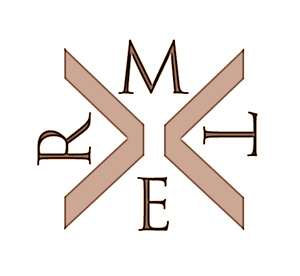 MR / TE is a collaborative, cross-disciplinary initiative of UHM Outreach College, Community Services Division, and UHM College of Languages, Linguistics, and Literature. MR/TE’s co-directors are Tim Slaughter and Frank Stewart. This past weekend, His Holiness the Dalai Lama spoke at two events at the Stan Sheriff Center on the UH-Mānoa campus. He addressed high school and college students at the first event, “Educating the Heart.” At the second, “Advancing Peace through the Power of Aloha,” he addressed the general public. The two talks were part of a series of events planned by a Hawai‘i-based initiative called Pillars of Peace. Mānoa interns Megan Oshiro and Nelson Rivera attended the Saturday event, and Pat Matsueda the Sunday one. The Dalai Lama spoke extemporaneously, drawing on the more than fifty years he has tried to lead the Tibetan people while exiled from his homeland. He characterized the PRC’s takeover of Tibet as a tragedy, but one that “woke” Tibetans and united them in a way they had not been before. 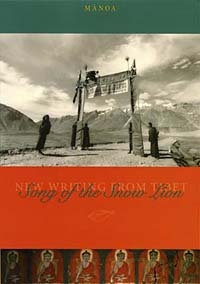 Having accepted that Tibet is a part of the PRC, he exemplified two of the principles he was trying to express: being realistic, and using one’s intelligence to understand situations, particularly the elements that appear to be in conflict. He also drew connections between valuing education and using one’s native intelligence to solve problems and stressed the importance of approaching people on a personal level, without bias and judgement. When we do that, he said, we open ourselves to the possibility of empathy and compassion. And when we do that with our enemies, we make forgiveness possible. Forgiving, he stressed, does not mean accepting wrongful deeds. MANOA has published many stories, poems, and essays about the ethical imagination and reconciliation. We hope to bring these to readers' attention and discuss events that are related to our work.